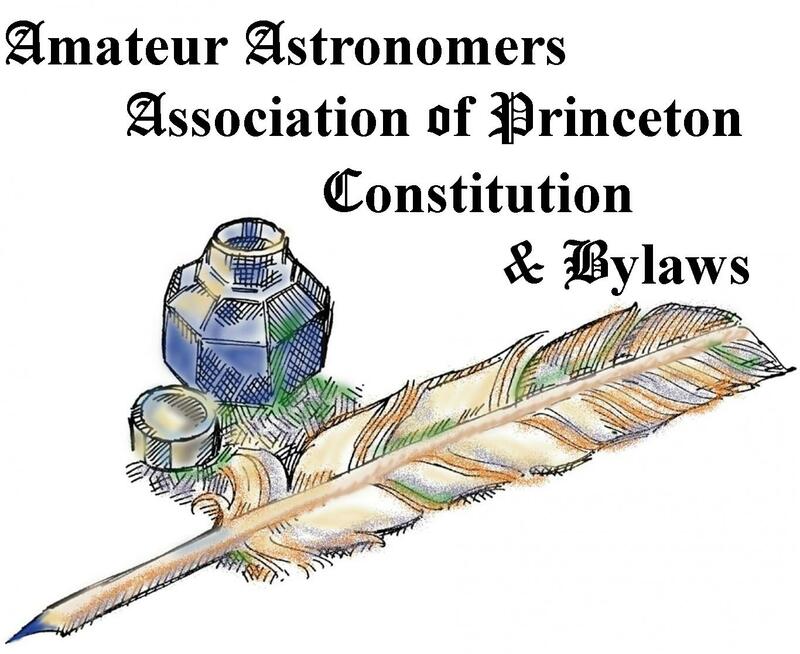 The name of this organization shall be Amateur Astronomers Association of Princeton, Incorporated (hereinafter abbreviated as AAAP). 1. To gather knowledge of the universe about us by observation and research. 2. To disseminate this knowledge to our associates. 3. To further an interest in astronomy in others. The officers of AAAP shall be as follows: Director, Assistant Director, Secretary, Treasurer, and Program Chair. They shall collectively constitute the Board of Trustees. Their term of office shall be one year. General membership shall be open to any person paying dues with the proviso that any member under the age of 18 must be accompanied by a responsible adult while at any AAAP meeting, other function, or observatory. Amendments to the Constitution and By-Laws of AAAP may be proposed by a majority vote of the general membership at any regular business meeting, provided that a quorum is present as provided for in the By-Laws, or by a vote of the Board of Trustees. Before any amendment shall be adopted, the amendment shall be discussed at regularly scheduled general membership meeting and a written notice of the proposed amendment shall be distributed to all members, together with a ballot. No amendment shall take effect unless it receives a majority vote of the total membership. Voting by mail or e-mail is permitted. Upon dissolution of AAAP, the Board of Trustees shall, after paying all debts outstanding, dispose of all assets of AAAP to a non-profit organization qualifying as exempt under Section 501(c)(3) of the Internal Revenue Code of 1954 (or the corresponding provision of any future United States Revenue Law). A. Director The Director shall preside at all meetings of the Board of Trustees and at all general membership meetings. He shall appoint such committees as may be necessary to further the operations of AAAP. He shall be eligible to vote on all items of business that may be transacted at any meeting. B. Assistant Director The Assistant Director shall assist the Director in his duties and shall act in his place in his absence. C. Secretary The Secretary shall maintain minutes of all meetings of the Board of Trustees and of the general membership, shall keep a record of the membership, and shall notify members of meeting dates. The Secretary may delegate such of these duties as may be appropriate, in consultation with the Director. D. Treasurer The Treasurer shall keep a record of all financial transactions of AAAP. He shall be responsible for the handling, safekeeping, and disbursal of all funds. In case of absence of the Treasurer, the Director shall act in the foregoing capacities. E. Program Chair The Program Chair shall select a Program Committee, over which he shall preside. The Program Committee shall be responsible for arranging suitable astronomy related programs at general meetings. A. Nominating Committee At the March general membership meeting, the Director shall appoint a Chair of the Nominating Committee, who shall then select other committee members. No member of the Board of Trustees shall serve on the Nominating Committee. The Committee shall report its nominations for officers at the April general membership meeting. B. Election of Officers Officers shall be elected at the Annual Meeting of AAAP in May. Subject to the quorum requirement of Section 5, Subsection C, a simple majority of votes cast shall be sufficient for election. Newly elected officers shall assume office at the end of the Annual Meeting. C. Vacancies If the office of Director shall become vacant, the Assistant Director shall become Director. If any other office shall become vacant, it shall be filled by a majority vote of the Board of Trustees. Any officer may be removed from office for improper performance of duties by a two-thirds vote of the members present at a general meeting, subject to the quorum requirement of Section 5, Subsection C, provided that at least three weeks written notice of the proposed action has been given to all members. Any member may initiate such action. For reasons of objectionable conduct, any member may be expelled from AAAP by a two-thirds vote of the members present at a general meeting, provided that at least three weeks written notice of the proposed action has been given to all members. Any member may initiate such action. A. Board of Trustees The Board of Trustees shall meet at any time so designated by the Director or a majority of the Board, upon seventy-two hours notice to the members of the Board. Three member of the Board shall constitute a quorum to transact the business of the Board. B. Committees Committees shall meet at any time so designated by the Chairman or a majority of the Committee, upon seventy-two hours notice to the members of the Committee. C. General Membership Meetings of the general membership shall be held monthly at a time and place designated by the Board of Trustees. There shall be an Annual Meeting in May at a time and place announced by the Board of Trustees at least two weeks prior thereto. Robert's Rules of Order shall govern all business proceedings. Quorum shall equal 15% of membership. A. Dues Annual dues shall be decided by members voting upon a resolution proposed by the Board of Trustees. B. Bank Deposits The Treasurer shall deposit all funds not required for operating expenses in interest-bearing accounts in the name of AAAP. If banks shall require that more than one person shall be listed as custodian of the various accounts, then the Director and other officers shall act in this capacity. C. Permitted Expenditure Purposes No monies shall be expended for any purpose other than equipment, construction and maintenance of any Observatory, publications, stationery, and related supplies, books, expenses related to speakers, AAAP meeting and event expenses, and legal fees. No monies shall be borrowed for any purpose, nor shall purchases be made on installment, credit or mortgage basis. a. The Director and any officer other than the Treasurer, together with the Treasurer, may authorize expenditure for any permitted purpose other than equipment or observatory improvement of up to $1000, or for equipment or observatory improvements of up to $200. b. The Board of Trustees may authorize expenditure for any permitted purpose of up to $1000, and may authorize in any amount an emergency expenditure that it deems necessary to preserve the property of the AAAP or the health and safety of members or the public. c. Any other expenditure in excess of $1000 must be recommended by the Board of Trustees and the recommendation must be published in AAAP's monthly newsletter together with the meeting date on which the expenditure will be voted. The expenditure must then be approved by a majority of the votes cast and not less than 30% of the paid membership. Members not attending the meeting may vote by mailed or e-mailed ballot provided that their ballot is received by the Secretary within 40 days of the meeting. E. Treasurer's Report At each monthly meeting, the Treasurer shall summarize the financial status of AAAP and shall be prepared to report all monetary receipts and expenditures if requested. An audit report of the Treasurer's books shall be presented at the Annual Meeting. The auditor shall be appointed by the Director. AAAP books, publications, and other written materials not located at observatories shall be placed in the custody of a Librarian appointed by the Director, who may also assign other members to care for other miscellaneous property. A. Observatories Owned and operated by AAAP shall be available for the use of members and their guests. Observatories are located in Washington Crossing State Park (New Jersey) near the Nature Center and in Jenny Jump State Park. B. Keyholders. Any member who passes a test covering the operation of the telescopes and the safe use of the equipment in a particular observatory and the facility itself shall be given a key to that observatory. The test shall be administered to any member requesting it, by members appointed by the Director. Operation of the telescopes must be supervised by a keyholder at all times. Every keyholder agrees as a condition of receiving his key to provide a number of nights of duty at the observatory as designated by the Board. Any member may have his key taken away if he abuses the equipment, fails to follow the rules for use of the observatory, or fails to use good judgment to protect the equipment and the facility. This action may be taken by a majority vote of the Board members. C. Other Members. Other members shall have access to an observatory at any time a keyholder is available to operate that observatory, or at times designated by the Board. D. Maintenance. The Board or their appointees shall have responsibility for maintaining the observatories and their related equipment.